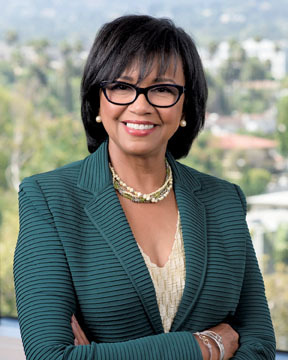 Cheryl Boone Isaacs lives in exciting times, perhaps among the most exciting in the Academy of Motion Picture Arts and Sciences’ nearly 90-year history. As president, the Windsor Square resident heads the organization which recently changed up its membership and governing board. Nearly half of the latest class of new members is now women and people of color, compared to what has been an almost all-white, all-male group since its earliest beginnings at the Ambassador Hotel in 1927. Increasing the diversity was on the Boone Isaacs agenda for a long time, she said last month in her office after returning from a film festival in Italy. She says that she has a long to-do list, which includes no less than building a world-class movie museum in the former May Co. building on Wilshire Blvd. Boone Isaacs and the Academy were working on plans to diversify the membership last year, and Boone Isaacs repeated the call in January. Then the 2016 Oscar nominees were announced. When not one person of color was nominated for a second year in a row, a boycott ensued, which brought Boone Isaacs’ and the Academy’s plan into a faster pace. Until recently Boone Isaacs was the only African American on the board of governors and among just a few women (three). She is serving her third term as president, and she is up for re-election for a fourth term, to be determined early this month. “I am very, very honored,” she says of her volunteer post. She has served 23 years on the board as governor representing the public relations branch. She credits a sense of humor to guiding her way. A political degree from Whittier College has probably helped. “Big time,” she says, as has her extensive background in marketing and communication. Boone Isaacs has been a motion picture marketing executive for over 30 years and has several Oscar winners in her resume. Boone Isaacs is as excited about movies today as when she was a child in Massachusetts and was allowed to stay up late to watch the Academy Awards. Only now, the Irving Blvd. resident is working with the producers of next year’s show. “The Academy has many different committees, and members are masters of their craft. Their wealth of information is staggering,” she says. She’s been a member of the Academy since 1987, and she has held every post from secretary to president. She has taught and been a guest lecturer at several universities, and she currently is an adjunct professor at Chapman University’s Dodge College of Film and Media Arts. She was also an adjunct professor at USC Cinema and Television School’s Peter Stark Producing Program; Columbia College Chicago, and Mount Saint Mary’s College. She tells her students to pay attention. No matter how boring or small the job, there is something to learn and you never know where it will lead. She remembers shopping at the May Co. long before it was targeted for the Academy’s new museum. A funding campaign is halfway to its $388 million goal for the Renzo Piano-Zoltan Pali design. Plans call for the museum to open in 2018. Boone Isaacs settled in Windsor Square 19 years ago, first on Lucerne Blvd. She moved to Irving Blvd. seven years ago. The neighborhood’s trees are a big attraction. So is Larchmont Blvd., where she has been an avid shopper, and misses the mom-and-pops. “My favorite shoe story is leaving,” she laments. But there’s always the movies. She enjoys them with her husband Stanley Isaacs, a producer, writer and director, whose most recent documentary is about Alan Ladd, Jr.